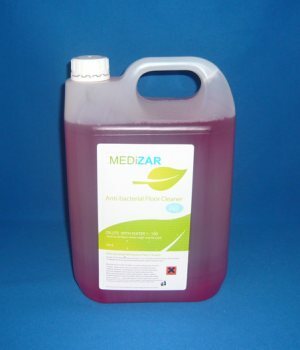 MediZar® Anti-bacterial Floor Cleaner & Sanitiser is an antibacterial, hard surface cleaner and sanitiser, alcohol free, with Advanced Barrier Technology. Any surface (e.g. hospital ward floor, clinic, ambulance etc) treated with MediZar® will remain contamination free from any tested bacteria for a minimum period of 30 days. Independent laboratory tested to kill MRSA, C Diff, E Coli, Salmonella + 99.999% of a wide range of other bacteria. MediZar® is tested to be food safe and skin safe. Whilst being gentle enough to use at home, MediZar® is still potent enough for use in more demanding ways and places. Its advanced formula means it can be applied to a variety of surfaces including walls, floors, doors, sink & baths, telephones, air-con filters, work-tops, mirrors and even soft furnishings. Once MediZar® has been applied to the surface it remains 100% effective for 30 days against tested bacteria. Regular cleaning with other products will not reduce its effectiveness thanks to its Advanced Barrier Control.